The Custard TV: Stranger Things: Is this the next big hit For Netflix? Stranger Things: Is this the next big hit For Netflix? Despite having had a Netflix subscription for a couple of months now I must admit that I've never really used it all that much. After an initial interest in checking out some of the critically-acclaimed shows I'd heard so much about I was burned once too often by the likes of Love and Master of None; neither of which I particularly cared for. Since then I've mainly used it to rewatch episodes of TV shows I've already seen rather than check out something new. This week I was directed towards Netflix's latest original series Stranger Things created by Ross and Matt Duffer, a show that I had not prior knowledge of before plunging in. I personally think that was the best thing to do because almost instantly I was taken up with this 1983-set tale of a small Indiana town which is plunged into mystery after a twelve-year-old boy disappears. The 12-year-old boy in question is Will Byers (Noah Schnapp), a rather geeky kid who seemingly spends most of his days playing Dungeons and Dragons with fellow nerds Mike (Finn Wolfhard), Dustin (Gaten Matarazzo) and Lucas (Caleb McLaughlin). Rather predictably these boys are eager to help when they learn what's happened to their friends but are forced to hunt for him in secret after their parents are worried what might happen to them. Meanwhile Will's singer mother Joyce (Winona Ryder) starts to go a little off the rails with only her older son, the introverted Jonathan (Charlie Heaton), to comfort her. Running alongside the story of Will's disappearance is the fantasy element which revolves around the shady laboratory that's on the outskirts of the town. 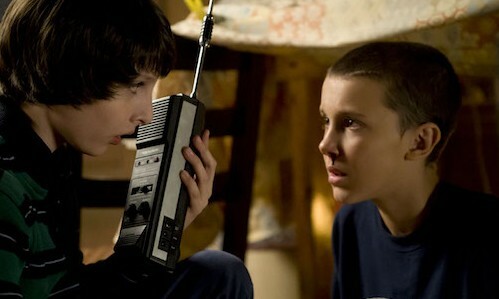 Escaping from the lab in the first episode's early scenes is a young girl with a shaved head (Millie Bobby Brown) who is called Eleven based on the fact that she has a tattoo on her hand with the numbers 011. Eleven initially finds refuge with a kindly diner owner but has to go on the run once again after her captors quickly locate her. The first episode ends with Eleven running into the path of Mike, Dustin and Lance as they hunt for Will with the boys later taking the mysterious girl in. The subsequent episodes sees Eleven gradually learning how to be more like a normal kid by spending time with the boys and hiding out in Mike's basement. At the same time the town's sheriff Chief Jim Hopper (David Harbour) begins investigating Will's disappearance and soon discovers that there may be something untoward going on in the mysterious lab. Unfortunately for Hopper he's one step behind as other odd events start to occur in the town including another disappearance and Joyce's insistence that Will is communicating with her via the use of Christmas lights. 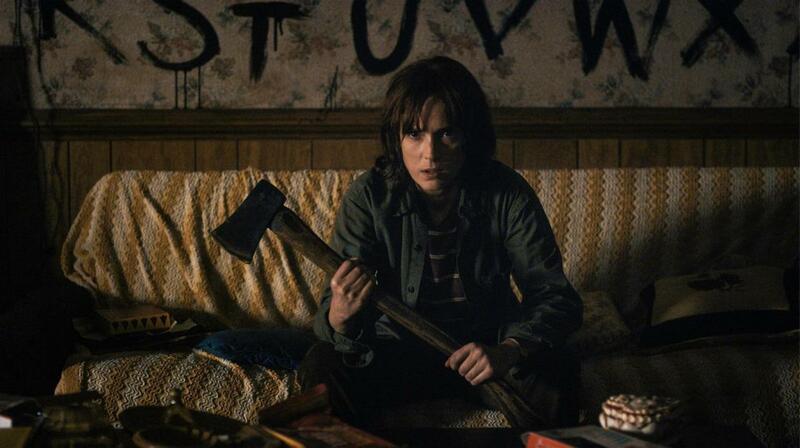 Saying anything else about the plot would give too much away and I do feel it's best knowing as little about Stranger Things as possible as I found one of the joys of the show to be its unpredictability. I think the appeal of Stranger Things to the majority of us critics of a similar age is the way in which it references almost every film that came out in the 1980s. Initially there's an obvious parallel to be drawn between this show and Goonies due to the relationship between the boys and the adventure that they go on. There's also more than a few references to E.T. with Eleven almost feeling liking an approximation of the titular character from Spielberg's classic. Furthermore you can draw comparisons with darker films from the 1980's such as The Thing as well as plenty of Stephen King novels. There are even some nods towards the classic teen movies of the 1980s thanks to the subplot involving Mike's sister Nancy (Natalia Dyer) and her burgeoning relationship with popular high school kid Steve Harrington (Joe Keery). I don't think it's any coincidence that the only two recognisable names in the cast; Winona Ryder and Matthew Modine, both got their big breaks in the 1980s. I was rather impressed by Ryder as the mother plunged into terror following her son's disappearance and refusing to believe that he was dead. She particularly excelled in the scenes in which Nancy had seemingly plunged into madness and had set up Christmas lights all around her house in hope of communicating with Will. Meanwhile Modine played Stranger Things' antagonist the shady Dr. Martin Bremner who is intent on tracking down Eleven and covering up whatever happened to Will. Modine is utterly chilling to the extent I wish I'd seen more of him throughout the eight episodes. But despite fine performances from the adults it's the kids who really steal the show. Their story was by and far the best element of the programme. I thought that Finn Wolfhard was great as Mike, the de facto leader of the group whose growing feelings for Eleven almost jeopardise his friendship with Dustin and Lucas. But it's Mille Bobbie Brown who gives the best turn as the enigmatic Eleven as she's able to communicate years of pain without uttering any lines of dialogue. Brown's physical acting skills are a joy to watch from seeing her chow down on junk food to watching her pained reactions to some of the situations she finds herself in. Even the more outlandish attributes of the character are made strangely believable thanks to the grounded performance that this young actress delivers. As somebody who isn't a massive fan of science fiction I have to say that once the story started to take a turn for the bizarre I wasn't as interested. But one of Stranger Things' biggest selling points is that it doesn't particularly alienate those who aren't big fantasy fans. The Duffers placed as much importance on the relationship between the boys and Eleven as they did on strange beasts and alternate dimensions. At its heart its a story about the relationships between parents and children and adolescent friendships. Although the final episode in particular did plunge into sci-fi/horror territory I still think it kept itself as grounded as it could due to some fine scenes between Mike and Eleven. I would be really interested to hear the opinions of somebody who possibly didn't get all of the references to the eighties films that were scattered throughout Stranger Things as the nostalgic element was one of the biggest reasons I enjoyed the show. I do feel that the programme may not receive the universal praise that the likes of House of Cards or Orange is the New Black have but it will probably go on to be a cult hit especially amongst those like myself who loved spotting the film and TV references. On the whole I found it to be an easy show to power through as it was only eight episodes long and to an extent almost felt like an extended cut of a 1980s blockbuster rather than a show in its own right. I do also believe that different people will find different things to enjoy in it and ultimately I found it to be unexpectedly entertaining as it was a show that both didn't tax my brain but at the same time never insulted my intelligence. All eight episodes of Stranger Things are available to watch on Netflix Worldwide now.